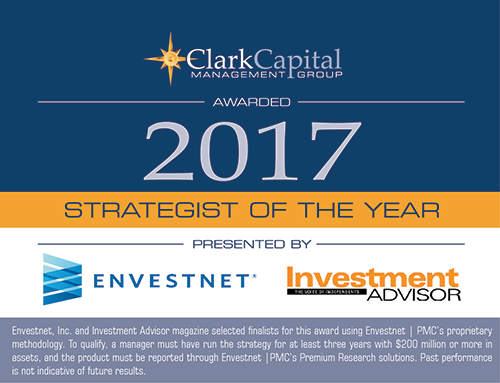 Philadelphia, PA, May 8, 2017 — Clark Capital Management Group, an independent asset manager, was named Strategist of the Year for its Navigator® Strategist Solutions by Envestnet® and Investment Advisor magazine. This achievement validates the firm’s ongoing commitment to providing asset management excellence, delivered in a flexible format and driven by clients’ life goals. Clark Capital Management Group is an independent asset management firm providing institutional quality investment strategies to individual investors, corporations, foundations, and retirement plans. The firm was founded in 1986 by Harry Clark, Executive Chairman, and has been entrusted with over $7.7 billion** in assets. Our investment philosophy is driven by a single-minded focus: to add value for our collective clients. This focus requires us to seek superior risk-adjusted returns over full market cycles. It compels us to maintain a long-term perspective and provide innovative investment management strategies that enable clients to achieve their life goals. For more information, visit ccmg.com and follow @ClarkCapital on Twitter. **As of 3/31/2017, includes sub-advised assets. Past performance is not indicative of future results. The ranking shown above is not indicative of the adviser’s future performance and may not be representative of any one client’s experience because the rating reflects an average of all, or a sample of all, the experiences of the adviser’s clients. Envestnet, Inc. (NYSE: ENV) and Investment Advisor magazine selected finalists for the 13th Annual Separately Managed Account (SMA) Manager and Strategist of the Year Awards using Envestnet | PMC’s proprietary, systematic, and multi-factor methodology for evaluating managers. This framework takes a variety of qualitative and quantitative criteria into consideration, such as investment process and style, performance, firm profile, customer service, and tax efficiency. To qualify for an SMA Manager and Strategist of the Year Award, a manager’s team must have at least three years of experience running a strategy with $200 million or more in assets. A manager’s product is also required to be reported through Envestnet | PMC’s Premium Research solutions, which includes more than 54,000 advisors and 2,500 companies including: U.S. banks, wealth management and brokerage firms, Registered Investment Advisers, and Internet services companies. Morningstar rankings are based upon Morningstar’s Q4 2016 ETF Managed Portfolio Landscape Report tracking five-year returns and selected risk statistics. Morningstar tracked 881 ETF strategies from 162 firms. Clark Capital did not pay to participate in the Morningstar ranking and is not affiliated with Morningstar.